Rossin House Hotel. York Street, southeast corner of King Street. 1867. Photograph by Octavius Thompson. Toronto Reference Library: T 12706. We don’t doubt that someone, somewhere has been thinking, “Now, what ever happened to that Dean Blundell fellow? You know, the one whose show on Edge 102 was cancelled after all those controversies and homophobic comments? I’d like to hear from him again.” Presumably someone has been thinking something along those lines, because today, Sportsnet 590 The FAN announced that Blundell will be hosting its new morning show. 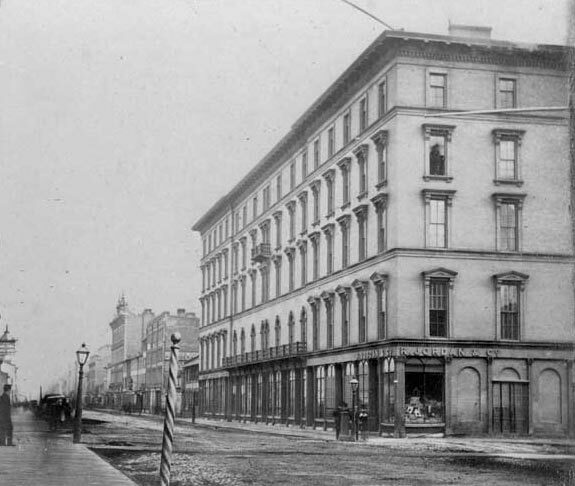 To cleanse the mental palate after Blundell-related thoughts, you might want to take a look at these photographs of Toronto, taken in 1856 from the top of the Rossin House Hotel at King Street West and York Street. (And here’s an annotated version of the panorama, courtesy of the Toronto Public Library.) They could be the first photos ever taken of Toronto, and they remind us of all the things that have changed, and how much we’d like to visit a pianoforte manufactory. If you’re upset that, say, your hometown hockey team just lost a home game to the last-place team in the NHL and seems headed for yet another failed playoff season, you probably shouldn’t throw team jerseys onto the ice to vent your frustration—that’ll just get you banned from the property for a year and ticketed for a provincial offence. Maybe what you should do instead is ban yourself from the property, so that the owners will learn that massive revenues are not guaranteed to flow from disappointed diehard fans indefinitely.